No movie has so seamlessly merged the genres of high school melodrama and horror as Brian De Palma's 1976 Carrie has. The first Stephen King film adaptation and based on his first book, Carrie is now considered something of a classic and a milestone. Last year it was voted the most popular movie for teens to watch on Halloween; how could I pass this one up? Carrie (Sissy Spacek, in an Oscar-nominated performance, all but unheard of for a horror movie) is a shy, unpopular girl with a hyper-Christian mother (who locks her in a closet with the creepiest statue of Saint Sebastian I've ever seen) who is constantly bullied in school. When she gets her first period while showering after gym class, she freaks out because her mother never told her what menstruation is, causing the other girls to taunt and hurl tampons at her. A well-meaning gym teacher defends her and tries to guide her on the path to leading a normal life, but the popular kids (led by Lewis from Robocop and a young John Travolta!) come to resent the trouble they get in as a result of teasing Carrie and hatch a plot to humiliate her even further. At the senior prom, they drop a bucket of pig's blood on the poor girl. Boy this sure sounds like a lot of hell to put this girl through! Did I mention that Carrie also has psychic powers? She can move things with telekinesis and all that (signaled by a musical cue strangely close to the Psycho theme), so when the evil popular kids push her over the edge, Carrie kills them with her brain. I went through middle and high school in the age of Columbine, so we were constantly told of the dangers of making fun of the quiet, awkward kids. 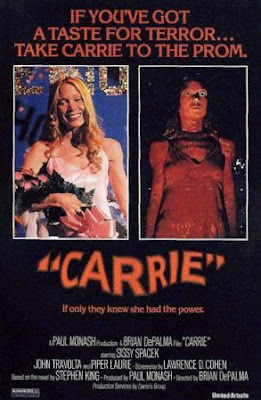 In a time before the widespread occurrence of school shootings in America, Carrie must have been revolutionary, not only because of its plot but because it basically invented the "final scare" (you know where the last surviving character thinks they're safe but then the killer's hand comes up out of the ground at the end of the movie, scaring you a final time). Filled with teenage revenge drama and metaphors for womanhood and sexual awakening, it's no wonder Carrie is so famous. I really liked this one, but mainly because I have a soft spot for movies that depict the cool kids at school being mercilessly slaughtered (I'm a big Heathers fan if you haven't figured it out).